MonitorChecker(v4)_LAB.psd is encoded in LAB color and saved in Adobe® Photoshop® format. It also uses layers to include an instruction page and more functionality. Fully color managed versions of Photoshop (versions 6-CS4) are needed to use it. Photoshop Elements does not directly support LAB, but it can open the MonitorChecker image by converting it to sRGB. MonitorChecker(v4)_LAB.psd is available on the AaI&A documents page as a public link or you can click here to download it. A view of the MonitorChecker target with its “Gamma square” layer turned on in Photoshop. Calibrated displays are essential for those who want to see digital image files reproduced as closely to their encoded colorimetric values as possible. That’s what color management is all about…using embedded color tags (ICC profiles) to calculate accurate colorimetric values for the typical RGB or CMYK encoded data and also using those colorimetric values to translate the image color and tone from one device to another. In a color managed browser application with a calibrated monitor, the reproduction of the MonitorChecker target shown in the image above should appear very close to how it will look in Photoshop. However, many visitors to this site will not be looking at a calibrated monitor, and some internet browsers are also not color managed. So, the solid patches may not blend well with the interlaced line patterns surrounding them. In this situation the target image is indicating that your system and/or browser application is not calibrated for accurate display of sRGB encoded images (the “default” colorspace of the internet). Because computer monitors are often the primary way that photographers evaluate and adjust the color and tonal properties of their digital images, accurate and repeatable calibration is essential. I created my first MonitorChecker image target several years ago as a sanity check to deal with issues I was having with some display calibration software. I had tried a few instrumented applications and found that although they completed their task reasonably well and in some cases “validated” their own results, the actual results still differed. Some calibration software is simply better than others, and not all displays calibrate equally well even using the same calibration software. I wanted an independent way to verify that my monitor calibration was as perfect as my system hardware would allow. Today, if you search the internet you will find numerous visual calibration methods that rely on a basic gamma testing pattern similar to the one utilized by the “Gamma Square” layer in the MonitorChecker target. 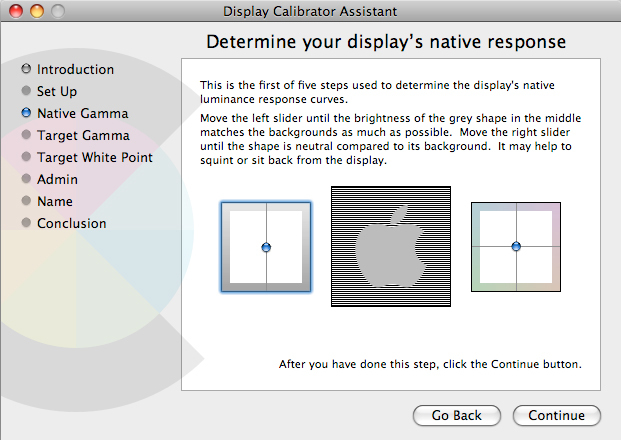 For example, the Apple “Display Calibrator Assistant” software included in the MAC OS is an excellent example of this visual calibration technique, especially when used in “expert” mode. To use a visually based calibration you need to start with a baseline profile in order to colorimetrically define the display’s red, green, and blue primaries. Some programs let you manually enter them as well. The software uses these values and your visual tone edits to build a new matrix-based profile with improved tonal curve response. This is where many Mac users gain an advantage. By pairing an Apple Cinema Display with one’s Mac computer or using an iMac with built-in display, Mac users are given an initial display profile that is an appropriate starting point for further calibration. They can then run the Display Calibration Assistant to improve their calibration state. However, what Display Calibrator Assistant and other visual calibrators often lack is a target image like the MonitorChecker target that verifies just how patient and fatigue-free one remained while performing the visual calibration. Patience and good color discrimination are essential when trying to perform a visual calibration. One of five tones the Apple Display Calibrator Assistant presents in expert mode for the user to match lightness and gray balance using the two sets of sliders to adjust the field containing the sillouhette of an apple. Color management experts universally agree that a colorimeter or spectrophotometer and good calibration software yield more repeatable and consistent results than trying to calibrate a monitor by eye. That said, an instrumented calibration should also be independently checked with a good visual target to determine if it has achieved what was expected. Even software applications that “validate” the calibration state sometimes just remeasure the same color patches used to produce the calibration and display profile in the first place. The profile can contain subtle gray balance errors or larger deviations for other colors not used in the calibration/profiling process. Thus, some validation procedures overlook any interpolation errors and therefore give a false sense of assurance that high accuracy was achieved. The MonitorChecker target evaluates the critical gray balance, shadow, and highlight tone reproduction of a CRT or LCD display. Achieving smooth tonal gradients from monitor black to white without clipping or unwanted chroma in the neutrals is very demanding on all hardware and software components of the system. The target has undergone some refinements over the years, and in this latest version, I finally got around to adding some basic instructions on how to use it and what it should look like on a well-calibrated monitor. It also now includes a 101 step grayscale designed to show steps with just noticeable differences of 1∆E. The 101 tonal steps reveal any “kinks” or “flat spots” in the monitor’s tone curves. 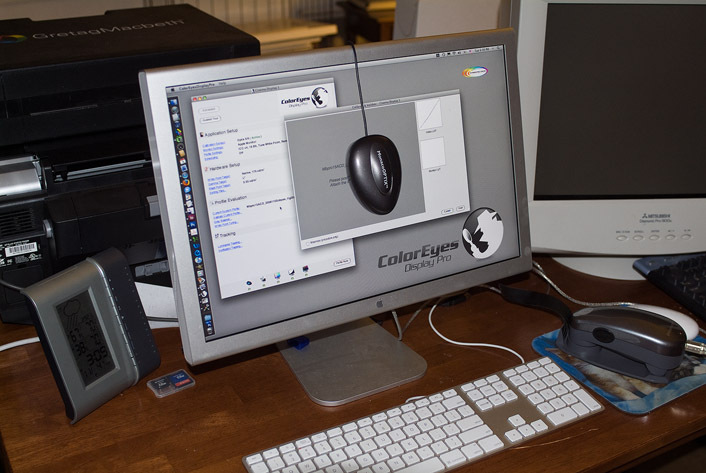 An instrument-based calibration of a 20 inch Apple Cinema Display using ColorEyes Display Pro software and an Xrite DTP94 colorimeter. Using an Xrite EyeOne Pro spectrophotometer (seen to the right of the computer keyboard) with ColorEyes Display Pro produced essentially identical results. In recent tests on newer calibration software, I am once again finding that the MonitorChecker target enables me to identify optimum settings and critically evaluate the final calibration results. For example, when calibrating my 20 inch Apple Cinema Display with ColorEyes Display Pro software (version 1.42.1) from Integrated Color Corporation and either a Monaco Optix Colorimeter (i.e., Xrite model DTP94) or an Xrite EyeOne Pro spectrophotometer, I achieve superior gray balance using the recommended L* gamma setting rather than Gamma 2.2 or Gamma 1.8 settings. Unfortunately, the superior gray balance performance (ie. lack of color “ripple” in the 101 gray steps of the MonitorChecker) came slightly at the expense of the darkest shadow reproduction. 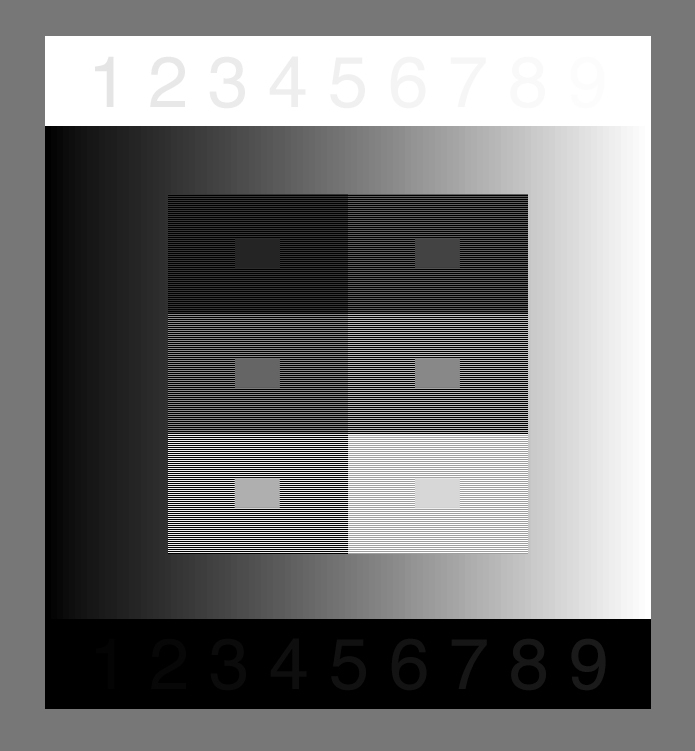 The MonitorChecker revealed that number “1”on the black background was clipped, “2” was about the lightness that “1” should have been, and too large a step was occurring between “2” and “3”. This deep shadow behavior was also easy to observe in the 1∆L stepwedge layer of the target. L values 1-3 are the deepest shadow tones which should be discernible from maximum black of the monitor. The ColorEyes Display Pro software has a normal blackpoint default setting of “minimim luminance”. I was able to solve the problem by adjusting the Display Pro software settings to use a manually entered blackpoint luminance value that was very slightly higher than the minimum achievable luminance on the Cinema Display and then re-running the calibration procedure. Gray balance remained excellent and the deepest shadow details uniformally stepped away from monitor black level. Very little dynamic range was sacrificed by manually entering the ever-so-slight increase in the black level aimpoint. The MonitorChecker target and the professional level adjustments of the Display Pro software enabled me to achieve a better combination of optimally tuned settings for my Apple Cinema Display unit than could be achieved by simply relying on default calibration aimpoints. The final calibrated state of the Cinema Display was excellent and the MonitorChecker image reproduced better than I’ve ever achieved with older calibration software. One would probably need a much more expensive display system supporting higher video card bit depth to improve upon the results.